A Mans First Fathers Day can be exciting and daunting at the same time. So used to celebrating this day as a son or grandson, not many new Dads know what to do on this special occasion! Help him celebrate this special milestone with a personalized gift or thoughtful experience that he will never forget. 1. Commemorate this special day with this handsome 5 x 7 First Fathers Day Wooden Frame. Include your favorite picture of them cuddling or a snap from the birth. Make it extra thoughtful with a photo from whatever adventure his first fathers day awaits so that he will never forget this special day. 2. Since parenthood, the two of you have barely had any me time let alone couple time. Take the time to plan a special day of pampering and relaxation as a special date night for the two of you. Schedule a couples massage or reserve a table at that new restaurant you’ve been wanting to go to. Take the time to indulge in each other like you did pre-parenthood. 3. Plan a special day to celebrate your new family and the new Father! Invite family, friends and other new Dads over for a backyard summer BBQ. Keep him clean with a personalized BBQ King Apron and make him the envy of the party with his Personalized BBQ Grill Set. Its a perfect way to celebrate the special dads and kick off the summer right! 4. If lavishness and extravagance is not your style, cook his favorite meal for a dinner date night at home. A simple card with a heartfelt message can go a long way to let him know that he is appreciated. Buy him those game tickets hes been eyeing for a much needed guys night out, plus this gives you some time to catch some rest! 5. 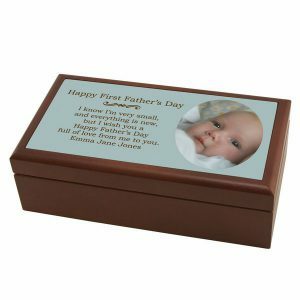 Give him a place to keep his special photo memories and keepsakes in a handsome First Fathers Day Photo Keepsake Box. Large enough to hold special documents and photos from his first year as a father. A safe place to keep his family keepsakes that have been passed on through generations. The first year of Fatherhood can be challenging and exciting. There are many times in the past year that he has doubted himself as a Father. 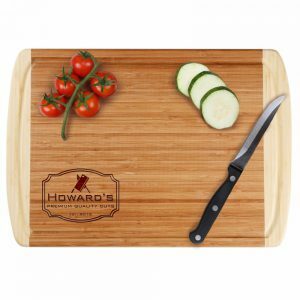 Reassure him with a special First Fathers Day and let him know how appreciated he is. However you decide to celebrate this special day, he is sure to remember it forever!